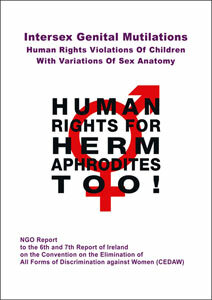 • September 2017: Pre-session NGO Report by StopIGM.org, presenting providing solid evidence of how today healthy intersex children are still submitted to IGM, paid for by the Universal Health Care System under the oversight of the Argentinian Ministry of Health, causing lifelong severe pain and suffering (see above). 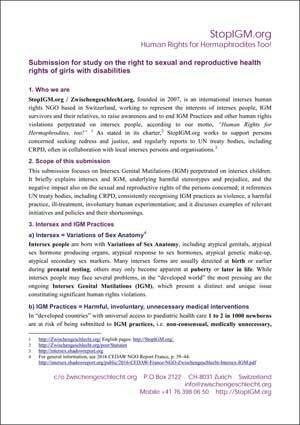 • April 2017: Joint Thematic NGO Report, providing solid evidence of how today healthy intersex children are still submitted to IGM, paid for by the Universal Health Care System under the oversight of the Argentinian Ministry of Health, causing lifelong severe pain and suffering (see here). • May 2018: In addition, the Joint Thematic NGO report has been endorsed by the Coordinadora de Profesionales por la Prevención de Abusos (CoPPA). >>> to be transmitted LIVE via webtv.un.org! • 01 Nov 2016: Thematic NGO Report by Ditte Dyreborg / StopIGM.org (see here). • 15 August 2017: NGO Report for the Session (see above), complementing the 2016 Thematic NGO Report. • February 2017: Thematic NGO Report for the CRPD Pre-Sessional Working Group (PSWG) by Intersex NGO Coalition UK (StopIGM.org / Zwischengeschlecht.org, IntersexUK, UK Intersex Association) DOC | PDF. 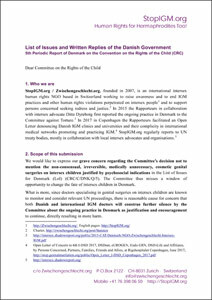 • 29 March 2017: The resulting List Of Issues Prior to Reporting (LoIPR) DOC | PDF by the Committee contains strong questions on intersex and IGM both under article 16 (Freedom from exploitation, violence and abuse, see para 11a) and article 17 (Protecting the integrity of the person, see para 12). • July 2017: Thematic NGO Report for the Session by Intersex NGO Coalition UK (StopIGM.org / Zwischengeschlecht.org, IntersexUK, UK Intersex Association; Leslie Jaye) (see above). • End of the 18th CPRD session: Concluding Observations for the UK, hopefully with another severe reprimand for IGM practices! • The Concluding Observations for Ireland unfortunately did NOT mention intersex and IGM. • The Concluding Observations for Italy, hopefully with another severe reprimand for IGM practices, are due at the end the 66th CEDAW Session on 24 July 2017 at 12:30h (or soon after). • February 2017: February 2017: Thematic NGO Reportfor the CRPD Pre-Sessional Working Group (PSWG) by Intersex NGO Coalition UK (StopIGM.org / Zwischengeschlecht.org, IntersexUK, UK Intersex Association) (see above). 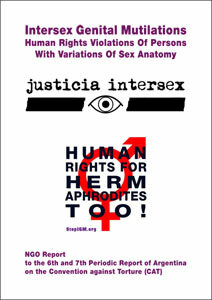 • 20 March 2017: Thematic NGO Report by Justicia Intersex / StopIGM.org for the 60th CAT session (see above). This report only contains information specific to Argentina and complements the thematic NGO report for France submitted for the 56th session containing more general information on Intersex, IGM Practices and why they are in breach of the Convention against Torture. • Unfortunately, the Concluding observations for Argentina did NOT raise intersex or IGM. In 2009, CEDAW was the first UN treaty body to include intersex in their Concluding Observations for Gemany (though not IGM) in their 43rd session. 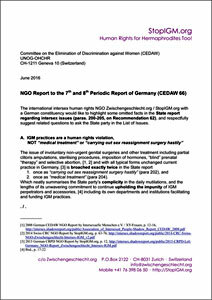 This time, after our PSWG Report and Briefing, CEDAW already included specific questions to Germany on intersex and IGM in their List of Issues (LOI), with Germany facing tough questions on IGM during the 66th session. 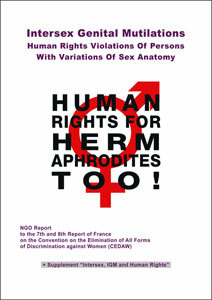 Intersex, IGM practices, the above thematic report, and the intersex report by Intersex Trust Aotearoa New Zealand (ITANZ) were mentioned under art. 16 in the List of Issues Prior to Reporting (LoIPR), para 32, i.e. in the initial List of Questions of the Committee to the State party, drafted during the 60th CAT session. Next, New Zealand will now have to provide written answers in its State report. Then NGOs and NHRIs can submit update reports, and finally the Committe will review New Zealand in Geneva, hopefully with togh questions on intersex and IGM, followed by strong Concluding observations (with binding recommendations to the State party). – Report, Transcripts + Podcast! • The Concluding Observations for Switzerland (and NL), hopefully with another severe reprimand for IGM practices, are due at the end the 65th Session of CEDAW (18 November 2016). Paras 34-41 on p. 13-16 of above report include the relevant sections on “Violence against and ill-treatment of intersex children” (paras 34-38) and “Remedies for violations of the rights of intersex persons” (paras 39-41). 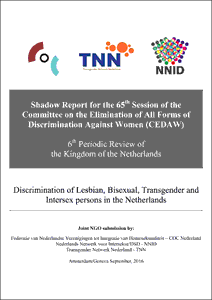 • The Concluding Observations for the Netherlands (and CH), hopefully with another severe reprimand for IGM practices, are due at the end the 65th Session of CEDAW (18 November 2016).